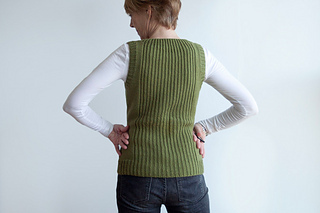 Emily is a shapely sweater vest with a slimming vertical rib on center front and back panels, bordered with stockinette. 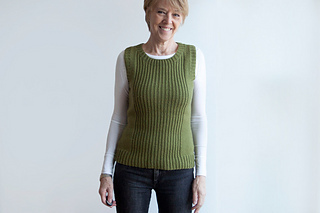 Her worsted weight wool works up quickly into a fun layering piece to ward off winter chill. 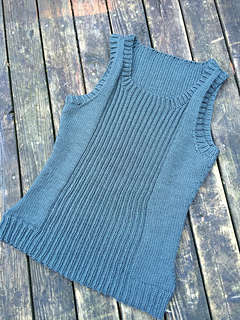 This piece is knit in the round until the armholes where it is then split and each side worked separately. Stitches picked up around the neckline and armholes continue the established rib pattern. 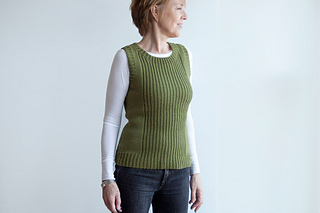 Long-tail cast on, circular knitting, decreases (ssk, k2tog, p2tog), increases (m1L, m1R), stitch pick up around neckline and armholes, short row shaping and 3-needle BO at shoulders, and blocking.